DAMAK, April 1: Prime Minister KP Sharma Oli has said that the country is pursuing development at a high speed. “The country will reach its goal of prosperity soon with development taking place rapidly. 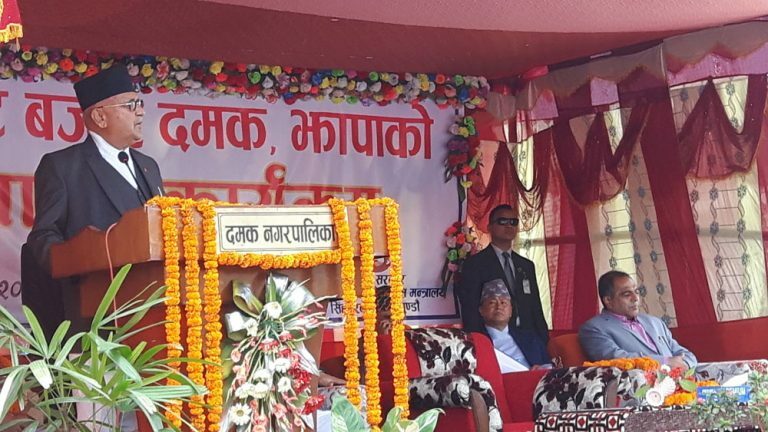 We all should unite in this regard,” said PM Oli inaugurating a livestock haat bazaar (market) in Damak-7 in Jhapa. “The government is committed to managing agriculture bazaar,” he added. On the occasion, PM Oli also inaugurated the administrative building of the bazaar. The livestock haat bazaar has been set up with the joint investment of Nepal government and the World Bank at the initiative of the Project for Agriculture Commercialization and Trade under the Ministry of Agriculture and Livestock Development and Nepal Livestock Sector Innovation Project.